For our latest client spotlight we’ve picked Sky Realty, a brokerage in Austin whose website uses our IDX products along with dsAgentReach Lead Manager to distribute incoming leads. 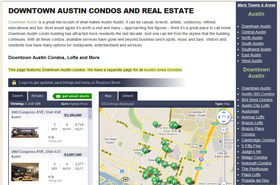 Their website skyrealtyaustin.com is a great example of how WordPress can be used for building a complete web presence; even for a large office with many agents. Sky Realty’s homepage is super simple and straight-forward: most of the page is taken up by a huge home search. Their site makes it clear to home buyers that they can jump straight into a search as soon as they land on the homepage. The search was built using our dsSearchAgent Quick Search module without much customization, so it’s very basic and straight-forward for users. They have also setup their dsSearchAgent options to send users to a custom results page. This way anyone who uses their quick search module will view their search results on a special page the Sky Realty team setup. Home buyers who stumble on your website want to see right away that they can search for homes, which Sky Realty’s website does very well. Like other sites we have featured here, Sky Realty has added links to their results page for visitors to click on to quickly switch to properties in other areas and cities Sky Realty serves. Using a clean and simple sidebar on the right side of their results page, they list links to different areas in the main city they serve, followed by links to other nearby cities in their market. Each link goes to a page specific for that area or city that includes a heading, a paragraph or more of text about the area, then a framed custom dsSearchAgent link. Having a unique page setup for each area helps with search engine placement, plus your text can help potential buyers learn about the area and what to look for in homes, and lastly, using custom IDX links on each page allows you to pre-build the search for buyers – making it easier to find homes and easy for you to choose what homes buyers will see. Pages like these, along with an easy list of them, can help buyers quickly find listings in an area they already have interest in, it can help guide buyers to look in areas they may otherwise miss, and because you can customize the properties shown on each link; you can feature your own listings, a particular builder’s listings, or other properties on each page. To ensure lead capture, Sky Realty has customized their dsSearchAgent settings to force potential buyers to eventually register. Home buyers can search as much as they’d like and browse through tons of homes, but as soon as a visitor tries to view the details of any listing, they must register. We’ve found that settings like this, where buyers are encouraged to search as much as they’d like without getting scaring off by a registration screen, is one of the combos that works great for conversion. And lastly, Sky Realty has setup their account using dsAgentReach Lead Manager so as people register, the leads automatically get distributed between the agents in their office. Sky Realty set their registration options to assign each lead to a user in a distribution list, they picked which agents are part of that list, and how evenly the leads are distributed – and we do the rest. Each agent can login and view their own leads that the main office website assigned them, and the broker can login and get an overall view of the entire office’s leads. It’s a easy solution for larger offices with many agents, and it’s nice to see a client using the functionality together on such a great site. Sky Realty has really put a great site together that helps capture leads for their office of agents. Making a dsSearchAgent quick search module the main focus of their homepage gives buyers easy, immediate access to listings. Their custom results page with links to each area helps buyers hone in their search and learn about other areas while helping with search engine placement. And finally, using dsAgentReach as their lead manager, they can easily distribute and manage all their incoming leads automatically. Their site is a fantastic resource for buyers that makes searching super easy with behind the scenes lead routing to makes things easy for their agents; an overall great site we are happy to feature. We found that a simple home page layout helps the visitor make a good decision about what direction they need to go. I see a lot of real estate websites that have no clear sign posts for the visitor. Building a site for the consumer first and search engines second makes for a better user experience. I have been pleased with dsAgentReach Lead Manager. I get instant notifications when I have been assigned a lead and I am able to go to the Diverse Solutions website to see what homes and areas the lead has been looking at. My latest client is a direct result of the Diverse Solutions lead generator! The latest changes to dsSearch are great and my clients have commented on how user friendly it is! I love the Diverse Solutions lead management system!! It is so easy to use. I love it when technology works so well with your industry’s needs. The Diverse Solution product is perfect for the Sky Realty website! We use over 500 links on our site along with the modules. Diverse is the best IDX available! Diverse Solutions has been a fantastic added feature to the amazing Sky Realty website. I’ve seen an increase in my business as a result of Sky Realty and Diverse Solutions. I closed several transactions last year that came through the round robin at Sky and use Diverse Solutions with my own website, as well. I really like the DiverseSolutions IDX! It is much better than what I was using, including the ability to easily set up neighborhood searches for my website. Great back end! Keep the upgrades coming … including a mobile or iPhone app! I’ve been happy with Diverse Solutions. It’s customizable and attracts interested parties. The Lead Management system on Diverse Solutions is great! I recently joined and I am closing on one of the Leads this week. Thanks for the blog article and example. I built mine without looking at examples and am now researching how others effectively use DS tools. or his agents but I can see no other explanation for her actions.